Slaintheva 12 yo (40.0%): This is the last wee bottle from Stephen Mathis stash... As you will remember Stephen from Malt Impostor brought me some awesome samples from Scotland to help my Blend Project a while ago and sadly enough tonight I am sampling the very last one. 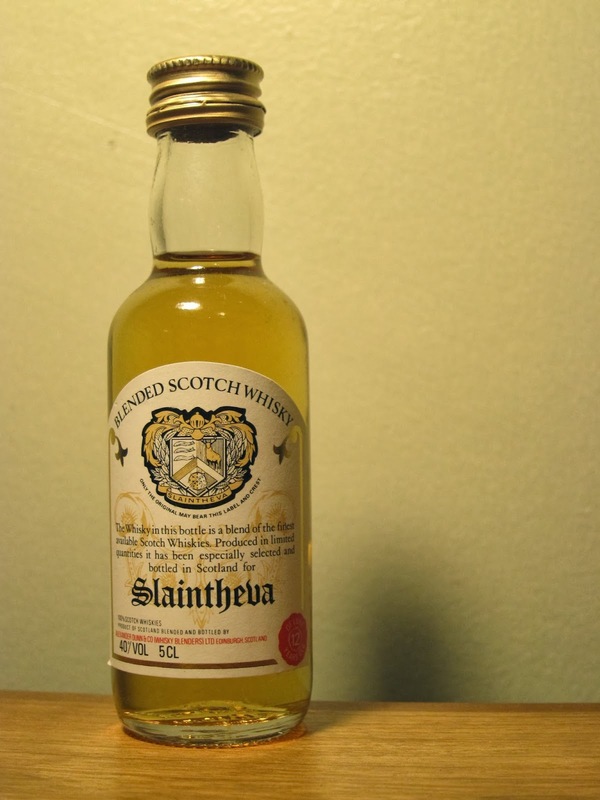 I couldn't reach any useful information online about Slaintheva except some very very old bottles. I assume it was a popular blend back then. All I know is that the brand is registered by Alexander Dunn & Company Whisky Blenders and the company is based in Edinburgh. Oh, wait a minute... And the label says on its low right corner with the smallest print that it is a 12 year old whisky. Color: Pale yellow, like a Pinot Grigio. Nose: Pretty nice and light. Cavendish bananas, lemon cookie dough and fresh apricots. Flower honey and polished dashboard of a brand new car. Adding water brings rubber tubing, sneaker shop, oranges and dry clay dust. Palate: Touch (tiny, tiny bit) of smoke, lemon zest and musty black garden soil. Water amplifies vegetal notes: green asparagus, barbecued banana peppers, endives and baked potato. Finish: Way longer than you would expect from a cheap blend. Barbecue ash, Sigg water bottles and salty butter. Overall: I liked it... I don't know if ever can see a full bottle of it again or not but it's totally worth to look for. It reminded me of Springbank EIF blends: citrusy and earthy. Great summer time pub whisky... Kind of surprised that I couldn't reach any information about the recent releases of this nice blend but I hope our ways will cross again with it somewhere. Thank you very much for all your help again, Stephen..!